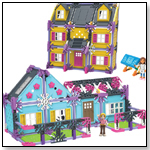 See below for a sampling of Educational and Developmental toys from companies who will be attending this year's ASTRA Marketplace & Academy in Anaheim, Calif. In this simulation of a real paleontology fossil dig, children dig for a fossilized shark tooth, brachiopod shell, gastropod shell, and “squid” shell. These real, millions of years old fossils are enclosed in a “brick” and are revealed by using the supplied scraping and brush tools (similar to what real paleontologists use). Young paleontologists then take a closer look at these fossils with the enclosed magnifying glass and learn about each fossil using the provided fun fact cards. "This is a unique fossil dig in that there are 4 real fossils embedded in each brick," Esther Novis, president of The Young Scientists Club, told TDmonthly. Launch date: January 2011. This environmentally focused toy teaches kids how to test water for impurities, with the option of uploading their results online and comparing with other kids’ finds. Includes information on global water quality and encourages kids to think of ways to use science and chemistry to assist countries with unsuitable drinking water. With the help of WordGirl and Captain Huggy Face, kids twist the rings to learn how to use consonants and vowels to build new words. Line up a letter on the left, and twist the next ring to find letters that make words from two to six letters long. Rings can be removed and rearranged. In addition, letters have numerical values, so kids can work on their math skills as they find words with bigger scores. 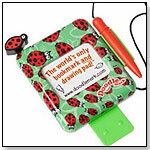 DoodleMark™ allows children and parents to interact with books together. Whether practicing sight words, working on vocabulary, learning to write letters, bookmarking their progress or just doodling a funny picture, this product is designed to help build a child's confidence in their reading and writing. It can be used as a classroom tool, at home to reinforce what's being taught in school, and as an incentive for reluctant readers. "DoodleMark is the world's only bookmark and drawing pad that clips to a book," Jennifer Kendra, VP sales and marketing at ReMarkable Reading Concepts, told TDmonthly. Launch date: November 2010. A delightful combination of wooden and felt pieces that have been graphically-enhanced to help youngsters pull of a pretend healthy lunch. Educo does it again with silk-screen graphics on the veggie and fruit pieces that fit with lettuce and cheese in felt to tuck in a whole wheat pita pocket. Just what the new food pyramid suggests. Launch date: February 2011. Animal Cottages by CHICCO USA INC.
Other products from CHICCO USA INC.
A small cottage with rooms and doors for 5 fun animal characters and 5 shapes, which can be inserted into the corresponding slots. Children can either find the correct key to open the door, or lift the roof off and remove all of the contents in an instant. The Animal Cottage Shape Sorter helps children develop their hand & eye coordination and logical association skills. 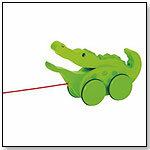 This pull-along wooden crocodile flaps his mouth as he rolls along. The wheels are coated in rubber to help eliminate the sound of the toy being rolled around the house. Made with water-based paint and wood from sustainable forests. Other products from EDUSHAPE LTD.
27 pcs of uniquely designed thick, chunky foam droplets stack and stay in place, allowing for creative design outcomes. Encourages creative thinking. Launch date: February 2011. 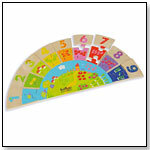 This environmental friendly wooden Rainbow Numbers Game is made of wood from FSC-monitored source, painted with water-based paints, packaged in a box made of recycled materials, and printed with soy-bean ink. Kids can learn counting and numbers. Color coded matching provides helpful hints to minimize frustration. The game helps develop motor and cognitive skills. Store the pieces in the nice and sturdy drawer box which comes with the toy. Tested to meet European and U.S. safety standards. 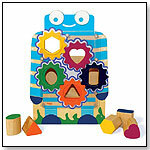 Funky Shape Sorter with Five Chunky Blocks. Kids learn about shapes and colors with the funky shape sorter. Rotate the gears, line up the shapes then slide the blocks through. Blocks drop inside the jet pack back with a funny clunky sound then slide out the side to keep the play going. 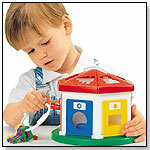 Helps to improve fine motor skills and develop shape and color recognition. Launch date: April 2011.